What’s the 411 on Waltham’s telephone museum? 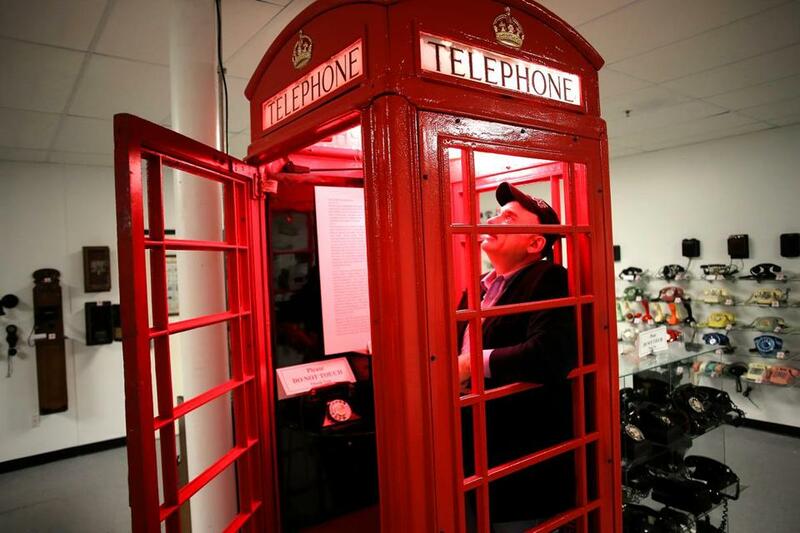 Vincent Valentine recently opened The Telephone Museum in Waltham. When you think of the Boston area, one of the first things that comes to mind is its history. There’s the Boston Tea Party, Paul Revere’s midnight ride, the Salem witch trials. But Vince Valentine would be quick to tell you that an important piece of history is missing from that picture. After admiring and collecting phones from a young age, Valentine said he was inspired to open the state’s first telephone museum last fall. 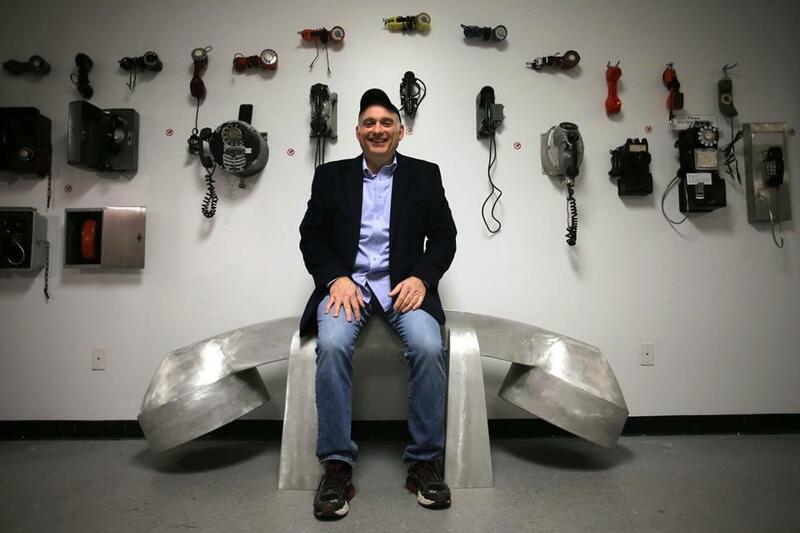 “There’s a lot of history here in Boston, but I’ll tell you 90 percent of the people that come in here have no idea the phone was invented in Boston,” said Valentine, director and founder of the Telephone Museum in Waltham. The walls of the museum at 289 Moody St. are lined with Valentine’s collection of telephones dating back to the late 19th century. He said he probably has around 300 on display, but the total inventory is closer to 1,000. The main attraction is a classic red British telephone box in the middle of the room. The suburbs west of Boston have plenty of other museums that aren’t what you’d expect. Watertown, by coincidence, has one of the world’s only plumbing museums. Brookline is a home of the world-renowned Museum of Bad Art. And one of the country’s two stamp and postal museums can be found in Weston. An electrical engineer by trade, Valentine started bringing his collection to area schools and doing after-school workshops. When he saw how popular his classes were with students of all ages, he decided to find a permanent location. At the opposite end of the museum, Valentine has set up a long work bench where he hopes to teach an Introduction to Electricity class. He also plans to work with various scout troops to help them earn electricity badges. After all, the telephone only came about because of an inventor’s curiosity about the many uses of electricity. A few days after obtaining a patent on March 7, 1876, Alexander Graham Bell transmitted the first intelligible message by telephone to his assistant: “Mr. Watson, come here, I need you.” He did most of his inventing at night while working days as a Boston University professor. The Plumbing Museum was also born from a recreational collection. The Manoogs, a family of plumbers, started collecting antique toilets, tubs, and sinks in the 1950s. In 1979, Russell Manoog established the American Sanitary Plumbing Museum in Worcester to house the collection. The museum was relocated to Watertown in 2007. It boasts a number of rare plumbing pieces, including a bathtub from the Civil War. There is even a display dedicated to vintage toilet tissue that dates to the early 20th century. From then on, Wilson, Reilly, and three of their friends kept their eyes out for any other “bad art,” which eventually led to the museum’s founding in 1993. This bad art can be seen at the museum’s three locations: the lobby of the Brookline Interactive Group, the basement of the Somerville Theatre in Davis Square, and the New England Wildlife Center in South Weymouth. “We decided that our purpose was to collect, exhibit, and celebrate art that would never make it in a traditional museum,” said executive director Louise Reilly Sacco. The Spellman Museum of Stamps & Postal History in Weston was also founded after a collection became too much to handle. Whitman-born Cardinal Francis Spellman, the sixth archbishop of New York, was a renowned stamp collector. His collection continued to grow until he could no longer sustain it. He asked Sister Fidelma Conway to act as caretaker of the collection in 1938. The museum did not break ground until more than 20 years later, in 1961. The museum’s collection is extensive, curator George Norton said. It features stamps from nearly every country in the world. One of the permanent exhibits features the penny black, the first adhesive postage stamp, which dates to the mid-19th century. Norton explained that the majority of the museum’s collection is shown in rotating thematic exhibits. Norton added that studying any specific item, whether it be a telephone, a bathtub, or a stamp, can be used to learn so much more about how the world has changed over time. At the Telephone Museum, guests can see over 300 phones, some dating back to the 19th century. The Plumbing Museum features antique bathtubs, commodes, and toilet tissue. The Museum of Bad Art’s stated aim is “to celebrate the labor of artists whose work would be displayed and appreciated in no other forum”. The Spellman Museum of Stamps & Postal History is dedicated to the appreciation of diversity through the medium of postage stamps and postal history. Located in the historic Francis Cabot Lowell Mill, the museum celebrates and explores the historical impact of industry on American culture. The museum features one of the largest collections of Girl Scout memorabilia in the country. Sophia Eppolito can be reached at sophia.eppolito@globe.com. Follow her on Twitter @SophiaEppolito.